White Sands Hair Products' interest in orchids for hair treatments was inspired from findings showing the flower's mysterious capacity for immortality, beauty, and its versatility to adjust to different environments with vibrant color. 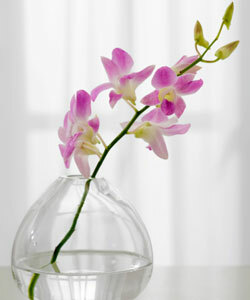 Orchid cell membranes contain a longevity molecule allowing for this eternal quality. In short, as the plant cells age, they continue to act as if they were brand new. These unmatched features pushed Fernando Salas, the creator of White Sands, to ply chemists with questions concerning how orchid extracts could affect hair moisture and shine on various hair types (dry, oily, frizzy and curly), and if it could improve hair color retention. After multiple tests, an orchid extract was found to provide the hair with the ability to hold moisture and control frizz which, in turn, gives the hair a high shine and the capacity to hold the desired hairstyle all day long. Further testing of orchid extracts led to the idea of an oil. This new product, called White Sands Orchid Oil, was infusing hair with many of the same characteristics as the orchid flower. Orchid oil provides moisture balance for hair that has become delicate from chemical treatments, thermal stress and daily UV and UVB exposure. It also brings the hair into a moisture balanced state by storing moisture at a consistent level and using it only when the hair and scalp need moisture. Tests also showed that even in high humidity areas, the oil would not allow an overabundance of moisture to weigh the hair down and make it frizzy. Orchid oil fills in the cracks and imperfections in each hair strand giving a high shine and making hair brilliant. When the hair strands are in perfect moisture balance, it closes the cuticle layer and keeps the hair from frizzing, thus giving hair incredible shine. Orchid oil is very light weight and does not weigh the hair down. Unlike most other oils and shine products, it does not affect the hair's ability to perform when styling. Because the orchid oil is not greasy and leaves no residue, the hair has the ability to hold a style with desired volume and texture. Coarse and curly hair is the ideal candidate for the orchid oil due to its drier state. During testing, White Sands noticed that when they applied the orchid oil to coarse curly hair, it balanced the moisture and had consistency in texture for defined curls, making the hair soft and shiny. The orchid oil eliminates frizz and works in conjunction with other styling products to enhance texture and repel moisture, while enhancing vibrant color. Ever wondered what the top ten ingredients used in natural hair are? Yea, we did too! Would you use orchid oil to help define and moisturize your curls?